Windows 10 offers a new and improved browser, Edge. Edge replaces the venerable Internet Explorer. Long Live Edge! 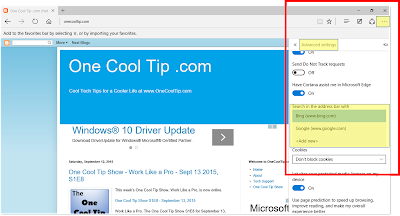 By default, Edge uses the Microsoft-owned Bing.com search engine. But what if you want to use another engine like DuckDuckGo or Google? Fear not. You can change the default. 1. Open Edge and visit the search engine you'd like to set as the default. 6. Press and hold the drop-down menu. 7. If your preferred search engine is shown, select it. If not, click <Add new> and choose from the list and set as "default". Click in the main browser window to close the settings box. That's it. When you enter a search in Edge's search box, your new search engine will be used. This search engine change only affects the Edge browser. If you search Cortana, Bing is the only option. Learn more cool tips about Windows 10 HERE.